This presentation will familiarize participants with the Quaranic Scripture on death and dying, and the related culture. It will help chaplains understand the steps to be taken during this process with full participation of family members and/or a local Muslim Imam. Participants will learn what to watch for when death is taking place and how to minister during this period. Cultural differences related to dying among Muslims from different regions, including the Middle East, Africa and Asia, will be examined. Chaplains and other caregivers from hospital and hospice settings. Imam Ashiq Kermalli BCC has been a staff chaplain at Orlando Health, Orlando, FL, since 2005. 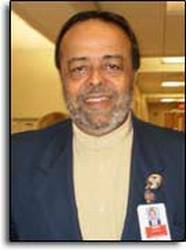 He has been a BCCI board certified chaplain and member of APC since 2007, and is a clinical member of ACPE. He is one of the founding members of Interfaith Council of Central Florida. Before becoming a chaplain, he served as an Imam for Husseini Islamic Center in Orlando for two years, and was a visiting lecturer in Toronto, Los Angeles, New York, Allentown, Charlotte, Denver and Atlanta. Currently, he is a visiting lecturer at Rollins College in Orlando.